In the library looking east toward the computer lab. 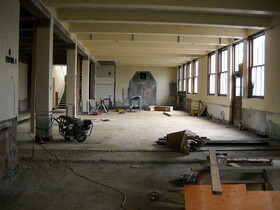 The lunch room, looking south toward the kitchen. 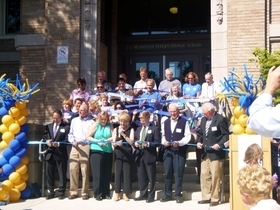 Originally established in 1914, McDonald Elementary closed in 1981 due to under enrollment, and reopened in 2010 at a temporary location in the Lincoln High School building (4400 Interlake Ave N) while our historic building underwent a massive renovation, modernization and refurbishment. 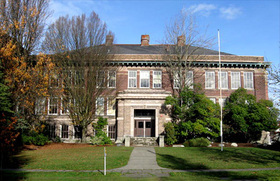 In January 2011, McDonald Elementary was selected to be a language immersion school by the Seattle Public School district. Spanish and Japanese were and still are the two language tracks offered. Language immersion began in the 2011-2012 school year for kindergarten and first graders. Children in second through fifth grade that year continued to receive top notch teaching from McDonald teachers in English. In each successive year a new class of incoming kindergarten students joined the immersion program and our language academics advanced another grade level. Other components of international education (not only language immersion but a complete, integrated curriculum that helps develop a global perspective) was rolled out in the fall of 2012, and we became McDonald International School. That same year, McDonald moved from our temporary location at Lincoln and was reborn in our historic location after the building's massive renovation, modernization and refurbishment was completed in time for the start of the 2012-13 school year. Read more about the renovation details below. 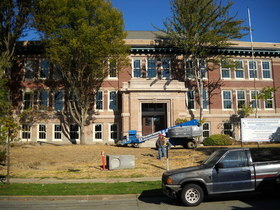 When the Seattle School Board’s president, Judge F. A. McDonald, died in July 1913 while the school was under construction, the members chose to name it after him. McDonald was elected to the board in 1910 and was a member of the committee that selected the site. Four of McDonald’s grandchildren would attend the school. With the 2015-16 school year we finally see language immersion provided at every grade level, kindergarten through fifth grade. McDonald students spend half their day learing literacy and social studies subjects in English, and half their day learning math and science in their immersion language (either Japanese or Spanish). Throughout the program, there is a focus on strong academics, a community school where all are welcome, nurturing social and emotional growth, infusing the global perspective, and building cultural competency. McDonald Int'l School's vision is to engage all students in partnership with family and community to become informed, compassionate, global citizens. Read more about our International Program - What is it? How does it work? 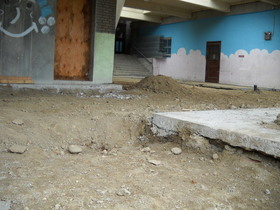 and our school's Vision and Philosopy. 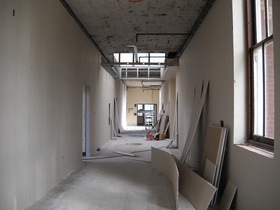 Now that demolition is complete and the majority of new ductwork, sprinkler piping and electrical conduit has been installed, the interior is beginning to take shape. 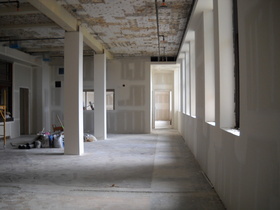 The new walls have been framed and sheetrocked. Painting has been on-going for a couple of weeks. New acoustic tile ceiling and preparation for new floor finishes are being installed. Cabinets will be arriving in the next couple of weeks. The building looks revived with the majority of the windows now replaced, the masonry cleaned and tuckpointed and new roofing has been installed. 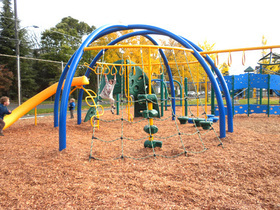 Overall, the project is about 70% complete and is on time and within budget.